What is the connection between Peter Pan, Sherlock Holmes, Winnie the Pooh and the noble sport of cricket? The answer is: the creators of all those literary characters played together on the first celebrity cricket team more than a century ago. Peter Pan author JM Barrie, a cricketing fanatic, gathered the most famous writers of his day to play on his amateur team - the oddly-named Allahakbarries - between 1887 and 1913. The team members included Arthur Conan Doyle, PG Wodehouse, AA Milne and Jerome K Jerome. Sunday marks the 150th anniversary of JM Barrie's birth on 9 May 1860. Next month the Allahakbarries team is being "reformed" for a special match to mark the occasion. "This is one of the most outstanding examples of the link between literature and sport," says Kevin Telfer, author of a new book called Peter Pan's First XI. "It's the first proper celebrity cricket team," he says. "There is something quite improbable about how these famous writers started playing together, and all their characters are quite fantastical." The unusual team name is down to a translation error ahead of the debut match in 1887. Telfer explains how two explorers on Barrie's squad mistakenly suggested that "Allah Akbar" ("God is Great") meant "Heaven help us". But the name stuck and the Allahakbarries cricket team was born. "The good thing is that it's got Barrie's name in it," says Telfer. It is perhaps no surprise that the team was soundly thrashed at that first match at Shere in Surrey. Barrie only discovered on the train to the match that one of his players did not know which side of the bat to hit the ball with. And, as Telfer's book points out, another player had turned up at Waterloo station ahead of the game in his pyjamas. "Barrie was not built for cricket, or any other sport really," admits Telfer. At 5 feet 3 inches, Barrie was dwarfed by the imposing six-foot frame of Sherlock Holmes creator Arthur Conan Doyle. But Conan Doyle changed the team's fortunes. "He was a very good cricketer and a remarkable all-round sportsman," Telfer says. "He is credited with bringing downhill skiing to Switzerland and played for Portsmouth FC in the late 1880s. And the one first class wicket he took as a cricketer was WG Grace." 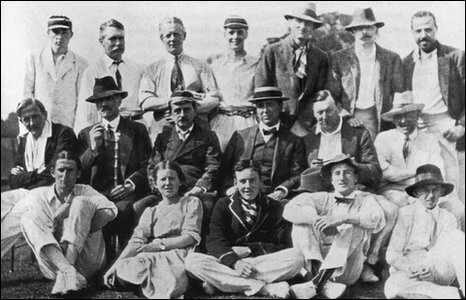 As Barrie became more famous he was able to recruit better players during what would become known as The Golden Age of Cricket. But the exploits of the Allahakbarries were brought to an end by World War I. A few of the younger players in Allahakbarries' final match in 1913 were killed in the war. The Allahakbarries never played together again. "There is this sense of Edwardian times being this gilded age," explains Telfer. "I tried to some extent to debunk that myth, but there was a sense of romanticism about that age and the Allahakbarries are clearly a part of that. "After the war it was impossible to recreate that same atmosphere and I'm sure that's one of the reasons why they never reformed - because it felt inappropriate." 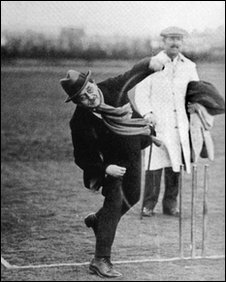 Telfer has been asked to play at the anniversary match in the Cotswolds in June in a re-enactment of the test matches between JM Barrie's amateur team and a Broadway XI. A number of events are also taking place in Kirriemuir, Scotland, the town where Barrie was born.